Anti-Social Behaviour involving motorcycles is a significant problem in the north of Warwickshire. There are two distinct groups of offenders who cause the nuisance. The second group are those who are involved in the stealing or handling of stolen motorcycles. They strip them down to a basic shell and then ride them on public roads, public spaces and private land. Riders do not wear protective equipment, this includes helmets, they rarely have driving documents and have no respect for the law. When the motorcycle is no longer of use they are dumped and in some cases set on fire. Some of these riders have been involved in collisions receiving life changing injuries and putting other people in danger of injury. In an effort to disrupt the offending the agencies in North Warwickshire have developed the below initiative. Recently, the number of people using public and private land in order to ride motor bikes illegally has increased. We receive numerous complaints from members of the public about these incidents. 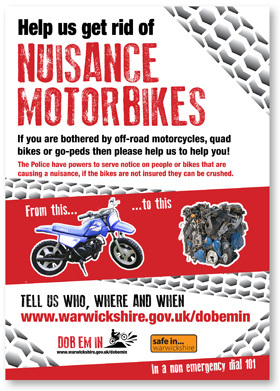 Postcards have been designed and will be distributed in areas used by nuisance motorcycles giving YOU the opportunity to send us information on the offenders and riders. If you receive this card, please fill out as much information as you can and send it freepost back to us. Or you can report on line by clicking this link www.warwickshire.gov.uk/dobemin and filling in the form. if you know who they are and where they live. We will then take your anonymous information and work with the Police to identify the riders and deal with them. 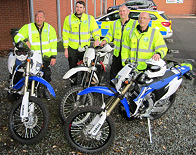 In September 2015 Warwickshire Police received funding from Warwickshire Police and Crime Commissioner to purchase 3 off road bikes to help tackle the issues of nuisance motorcycles. The bikes have enhanced the capabilities of the team. There are a number of trained officers to ride the machines and they will be targeting areas where incidents are reported. All incidents are collated for times, dates and offender descriptions and the team aim to deploy resources as appropriate to catch offenders. The Team operate in North Warwickshire and Nuneaton & Bedworth Borough’s.